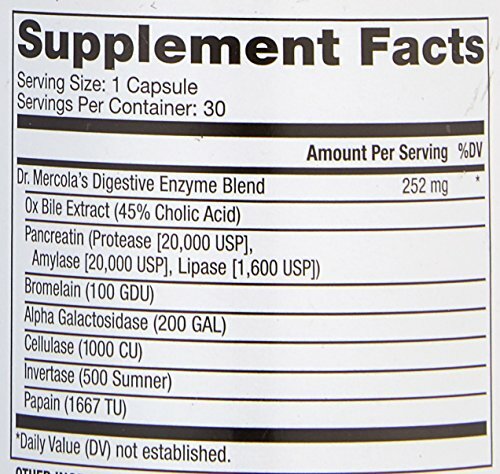 Dr. Mercola, Digestive Enzymes, 30 Capsules. Supplement Facts Serving Size: 1 Capsule Servings per Container: 30 Amount Per Serving %Daily Value Ox Bile 400 mg † Papain (1,200,000 USP Units) 100 mg † Bromelain 3000 mcu † Alpha Galactosidase 100 AGSU † Amylase 1000 SKB † † Daily Value not established. Other Ingredients Gelatin (capsule), cellulose and silica.